Most uterine fibroids do not produce any symptoms. If you are one of the “lucky” few with these symptom free fibroid tumors, you may even be unaware that you have the tumors until you have a pelvic exam. For other women with fibroid tumors, they may suffer from various symptoms including very heavy bleeding associated with having certain types of fibroids. The challenge with prolonged heavy bleeding is that it can deplete the body of vital iron leading to anemia which can be fatal if not addressed promptly. Heavy and prolonged bleeding is one of the common reasons for many women each year having hysterectomies. Before you lay down on an operating table, it is important to know that there are various natural ways you can use to reduce heavy bleeding caused by having certain fibroid tumors. The use of herbs to treat various conditions including gynecological issues goes back centuries. Many who are looking for a natural cure for fibroids usually try various natural remedies that also include the use of certain herbs that have been identified by naturopaths as an effective fibroid natural remedy. One of the herbs considered a fibroid natural remedy especially if you have heavy bleeding are the berries from the chaste tree. 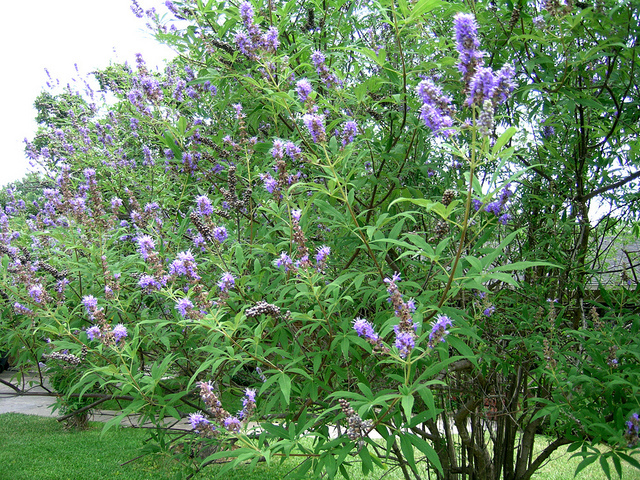 Chaste tree is also known as vitex (vitex agnus-castus), monk’s pepper, wild pepper or chasteberry. About 30 percent of women who have uterine fibroids may report having abnormal uterine bleeding which may eventually lead to excessive blood loss. The build up to heavy bleeding occurs gradually over several months and is not usually sudden. In addition to heavy bleeding, large blood clots may also form. The chaste tree is known as a hormone balancer. Although many doctors blame estrogen for fibroid growth, it is not the cause of the tumors. However, learning to balance hormone levels is one of the best ways to prevent fibroids from growing out of control and this herb is great for hormone balance to prevent having an estrogen dominant environment in the body which fibroids may love. When this herb is consumed, it will help to reduce estrogen levels while increasing the levels of the hormone progesterone resulting in balanced hormones which can interrupt the growth of fibroids as well as the symptoms of uterine fibroids such as heavy bleeding. Chaste tree’s ability to normalize menstrual flow is good for any woman who has erratic menstrual cycles, little to no menstrual cycle, heavy bleeding, spotting between periods, etc, and can also help to minimize menstrual cramps. In order to use chaste tree to regulate the menstrual flow, it is recommended to take about 40 drops daily for about 12 weeks or simply follow the manufacturer’s guidelines on usage. You should try this Chaste Tree Tincture to see whether it can help. The results from taking this dosage will not appear overnight. You have to be patient and give this herb time to work. There are also capsules available. While this herb is relatively safe, some side effects include stomach upset, rash, hair loss, itching, etc, that have been reported by a few women. Everyone reacts differently to various treatment methods and trying it is the only way to determine whether this herb will be beneficial or not. Avoid if pregnant or a girl who has not reached puberty. Herbs are definitely a great fibroid natural remedy and some can even help to shrink fibroids or reduce various signs and symptoms of uterine fibroids including heavy bleeding. Since heavy bleeding can lead to life threatening anemia, it is important to address this symptom immediately and there are many natural ways to do this without resorting to surgery including using MensReduce. For more of the best natural treatments for fibroids besides using chasteberry for fibroids, you must get your hands on the Fibroids Miracle guide. This holistic guide uses natural methods only and can help you not only eliminate but also prevent fibroids from developing ever again. Find out more about this bestselling guide here. Next Are Hair Relaxers To Blame For Uterine Fibroids?